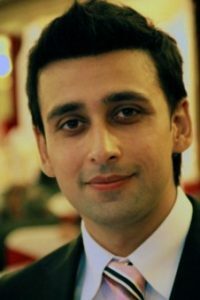 Sami Khan is a Pakistani film and television actor and model. He is best known for the television work on series such as Jinnah Ke Naam, Gharr Ki Khatir, Main, Sirat e Mustaqeem, Do Qadam Door Thay, Piya Man Bhaye, Dhaani, Rasm E Duniya, Be Inteha, Toh Dil Ka Kia Hua, Aisi Hai Tanhai, Khudgarz and Woh Mera Dil Tha. He is also known for his roles in the films Salakhain, Devar Bhabhi, and Gumm. Khan is the recipient of the Tamgha-e-Imtiaz in the Performing Arts Category in 2012. He has also won the Best Actor Awards for TV series Ghar Ki Khatir in 2011, and for the film Devar Bhabi in 2013. Born on July 6, 1980 in Lahore, Pakistan, his birth name is Manor Aslam Khan Nizazi. He gratuated in electrical Engineering from the University of Engineering & Technology (UET) in 2003. His brother Taifoor Khan, a NCA graduate, is also an actor and model. Sami started his career with film Salakhain, playing the role of a young police officer named Mansoor. He made his television debut with the PTV drama series Dil se Dil Tak. He also appeared in the dramas Sitam, Chaap, Angles, Apney Hue Paraye, Tootay Huay Par, Maaye-Ni and Main Gunehgar Nahi. He has been married to Shanzay Khan since 2009. *He was born on July 6, 1980 in Lahore, Pakistan. *His birth name is Manor Aslam Khan Nizazi. *He began his acting career with the film Salakhen in 2004. *He won the award for Best Actor in the 16th PTV awards for his role in Ghar Ki Khatir.